Latitude 44.799682. Longitude 1.617066. Located at over 1,600 feet up in the foothills of the Pyrenees, Causse de Gramat, Dordogne, in south-west France is The Shrine of Rocamadour, a place of pilgrimage since medieval times, if not before that. Roc means ‘Cliffe’ and Amadour (meaning ‘pure’) is the name of a Biblical saint of the 1st century AD who is otherwise known as Zacchaeus. In the steep-sided gorge above the river Alzou (on the right bank) stands ‘The Sanctuary of The Blessed Virgin Mary’ with a 12th century cave-church dedicated to St. Amadour and, on the hilltop above stands the pilgrimage church of Notre Dame, which houses the famous and much venerated cult figure of the ‘Black Madonna’ and another church of St. Sauveur that has numerous paintings and inscriptions recalling pilgrimages over the centuries. The town of Perigueux is 12 miles to the north-west and Cahors is 10 miles to the south on the E9 highway. According to tradition and legend, Amadour or Zacchaeus was a native of Galilee or Jericho in the Holy Land and some scholars think he was the husband of St. Veronica. It was St. Veronica who wiped Christ’s face in a cloth when he was being taken to his crucifixion on Golgotha. Earlier, Zacchaeus had climbed a sycamore tree in Jericho in order to see and hear Christ preaching. After the crucifixion he accompanied other members of Christ’s family, including the three Marys, and other close relations to Gaul bringing with him a sacred wooden image of the Blessed Virgin Mary made from wallnut that was, perhaps, carved by St. Luke the Apostle, or maybe by Zacchaeus (Amadour) himself? Though it is claimed by some authorities that the image dates from the 8th or 9th century AD. He also brought with him some drops of the Virgin Mary’s breast milk. The Black Madonna, Rocamadour, France. Amadour lived the life of a hermit in a cave at Rocamadour and placed the wooden image in there. Today the cave in the Alzou gorge houses a church that is dedicated to the hermit saint and contains his relics which were placed here by Benedictine monks in 1166, after they had found his body to be still incorrupt. St. Amadour’s feast-day was placed on the 1st May, and he or another saint called Amadour is venerated at Lucca in Italy where is kept the so-called ‘Holy Face’ – the famous cloth belonging to St. Veronica. Amadour according to legend, visited Rome at the time of St Peter’s martyrdom there and also, perhaps, Constantinople. He died about 70 AD. Today the wooden image of the Black Madonna with the Christ child seated on her knee is safely housed in The Chapelle Miraculeuse inside The Church of Notre Dame on the hilltop above the cave-church, which has been a place of veneration and pilgrimage since the middle-ages and remains so today. There is also a chapel dedicated to St. Michael the Archangel and what is said to be a miraculous bell. Also in the this Pyrenean town near the Church of Notre Dame is the 11th-13th century Basilica of St. Sauveur (Saviour), another place of pilgrimage down the centuries and, to which many kings, princes, saints and noblemen have payed homage. St. Bernard and St. Dominic are said to have come on pilgrimage here, as did Emperor Charlemagne. Many of these rich pilgrims have left inscriptions upon the walls and arranged for wall paintings to be initiated as a sign of their benevolence to the Blessed Virgin Mary and Christ the Saviour. The Shrine of Rocamadour – [The Black Madonna copyright image]. Begg, Ean., The Cult Of The Black Virgin, Arkana, London, 1985. 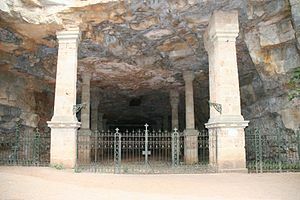 Categories: Ancient Churches / Chapels, Caves / Rock Shelters, The Shrine Of Rocamadour In Midi Pyrenees France | Tags: The Shrine of Rocamadour at Perigueux in France | Permalink.